Where do bananas go after they have languished a day too long in the fruit basket? In our house, they sacrifice themselves for banana chocolate chip muffins! I have accused our kids of ignoring the fruit just to get some more of these, they are definitely a family favorite. 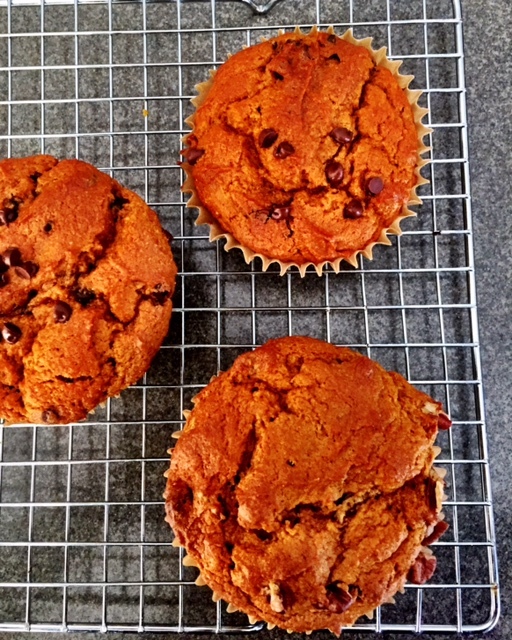 I took the recipe for a banana cake and added chocolate (because…chocolate…) and have baked them as a bread or muffin recipe for years. Set oven to 350 degrees. In a small bowl mix the first three ingredients and set aside. In a larger bowl cream the next five ingredients. Add the flour mixture to the creamed mixture, alternating with the buttermilk. Stir in nuts and chocolate chips. Pour into greased muffin tins or two greased loaf pan. Bake approximately 17 minutes for muffins, 40 minutes for bread loaves.